N light breeze, fog, cleared partly during the day. Playback on Garden Warbler, Reed Warbler and Grasshopper Warbler through the night, Tree Pipit and Meadow Pipit during the day. Nets open 05.30-20, netmeter hours approx. 4300. Ringed: White Wagtail 2, Tree Pipit 19, Meadow Pipit 33, Garden Warbler 5, Blackcap 4, Wood Warbler 1, Willow Warbler 17, Chiffchaff 1, Pied Flycatcher 1, Spotted Flycatcher 1, Chaffinch 1, Common Linnet 2, Yellowhammer 1, Reed Bunting 1. Total = 89. Also 11 controls. 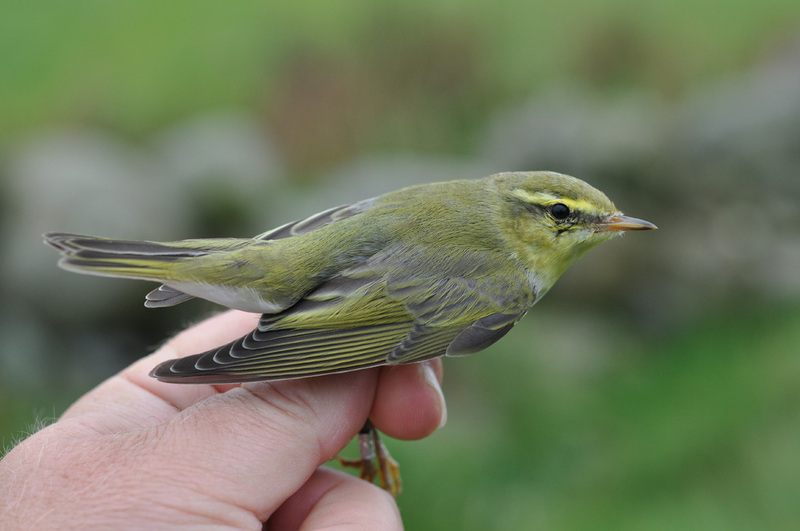 Wood Warbler 1 cy, aged by the fresh plumge. Bøksanger 1K. Ringmerket: Linerle 2, trepiplerke 19, heipiplerke 33, hagesanger 5, munk 4, bøksanger 1, løvsanger 17, gransanger 1, svarthvit fluesnapper 1, gråfluesnapper 1, bokfink 1, tornirisk 2, gulspurv 1, sivspurv 1. Total = 89. Også 11 kontroller. Observations: Harrier species 1, possibly juvenile Pallid Harrier; Black-tailed Godwit 4 juvenile islandica, Yellow Wagtail 2.